Lori Parlin and Frank Verdin are feeling somewhat besieged these days what with the number of new developments being proposed for Shingle Springs. Devoted to the peaceful rural nature of the area where they live, they are looking for others like themselves who don’t want the community to change. “We’re going to get hit hard if we don’t back each other up,” said Parlin. In particular, they are focused on fighting two projects that are currently in the early stages of being processed by the El Dorado County Planning Department. One proposed development, called Tilden Park, is located across the road from Parlin’s home. Twelve acres in size, the property is approximately 500 feet from the northwest corner of the intersection of Crosswood Drive and Wild Chaparral Drive and is zoned one acre residential. The property owners, Real Returns LLC out of Raleigh, North Carolina, want to rezone the property and put in 14 homes, a hotel, restaurant and a grocery store. Parlin said she’s not opposed to the property developing as originally zoned, but the new proposal would dramatically change the character of the area and add to traffic problems because of the estimated 4,000 trips it would generate. Frank Verdin, on the other hand, is concerned about a vastly larger project near his home which he said would affect 70 percent of the residents in Shingle Springs. Called San Stino, it would be located on the old Scheiber Ranch. The 645 acre property is presently zoned RE-5 on four parcels and AE (Agricultural Exclusive) on another and is south of Highway 50 between French Creek Road and Old Frenchtown Road, and South of Mother Lode Drive near its intersection with Buckeye Road. 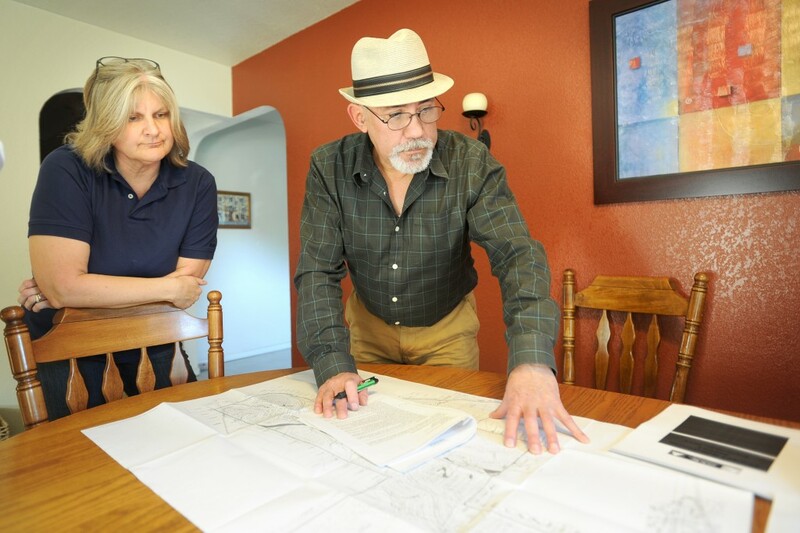 The Scheiber family wants to rezone the property and build 1,041 single-family homes. A portion of the property would be reserved for a future school, park or residential and 270 acres of open space would be preserved or created. Verdin, who first learned of the project less than two months ago, noted that “when I bought my property, which is adjacent to the proposed project, it was supposed to be 5 acre residential development.” What’s being proposed is a “city within a city,” he said. Since then, Verdin has circulated a flyer to his neighbors and held a meeting with them. But he said the developer has been going out to his neighbors and offering them perks if they didn’t contest the development. He said those perks are listed under project accommodations. Some of his neighbors told him they know the property is going to be developed anyway and it’s in their best interest to go along with it. “But it will be a train wreck because of the amount of traffic it will generate,” he said. Verdin is also concerned about the amount of designated open space in the proposed project. He says it would allow the owners to come back later and further increase its density. “And the county will allow them to develop them once the original development is put in,” he added. According to the El Dorado County Planning Department, both projects are on hold until an Environmental Impact Report is prepared. Parlin said another proposed project that has caught their eye is a 48 acre development across from Ponderosa High School. “These battles are going to keep coming up,” she said. Parlin and Verdin are now making an effort to reach out to the community to educate them about these developments and to organize a community alliance of those who want to take a role in shaping what happens in Shingle Springs. “The Board of Supervisors make choices for Shingle Springs without hearing the voice of Shingle Springs,” said Verdin. Right now their focus is on building an e-mail list of those interested in receiving updates on these projects and others. Residents who want to become involved can contact Parlin at info@ShingleSpringsCommunityAlliance.com. They are also on Facebook at No San Stino. Contact Dawn Hodson at 530-344-5071 or dhodson@mtdemocrat.net. Follow @DHodsonMtDemo on Twitter. The face book page is No Sanstino. Please go to it and click "like". If you hold your mouse over like, a pop down will appear. Click on "Get Notifications" to be kept abreast of new developments with the project. Money to be made, pockets to be lined. RURAL is passé anyway. Why is it that the first thing these developers try to side step is existing zoning in place. They need to be told to develop with common sense and stick to the existing zoning, in place, which is supported by the people near the projects, instead of how much will it cost to change the zoning to suit the development and who can be fooled into giving them the increased density.